April 19, 2019 (Ezega.com) -- The Omhajer-Humera border crossings between Eritrea and Ethiopia, which was opened in January this year, is closed today, according to reports. The Omhajer-Humera border crossings was opened with much fanfare in the presence of Eritrean President Isaias Afewerki, Ethiopian Prime Minister Abiy Ahmed, and regional state administrators of Tigray and Amhara. According to reports, Eritrea has closed the Omhajer-Humera border crossings to all, but those returning visitors. No reason was given for the closure by the Eritrean or Ethiopian governments. It is to be recalled that the Zalamessa border crossing was also closed in December last year just a few months after opening following the peace agreement between the two countries. April 18, 2019 (Ezega.com) -- Ethiopian officials have today confirmed that a cross presented to the Notre-Dame Cathedral in 1954 was among the recovered historical pieces, according to Africa news. It survived the Tuesday evening blaze that destroyed a huge part of the iconic church. The Deputy Head of Mission at the Ethiopian Embassy in France, Emmanuel Besnier confirmed via Twitter that the important cross offered to the cathedral by His Imperial Haile Selassie is now in custody of the Louvre Museum. “ We can now confirm, with great relief, that the #Ethiopian cross offered to #NotreDame cathedral in 1954 by HIH Haile Selassie has been spared from this week’s fire and is now safe at the Le louvre museum,” read his tweet. April 16, 2019 -- Ethiopia received a grant of 300 million USD from South Korea, according ENA report. The grant agreement was signed between Finance State Minister Admasu Nebebe and South Korean Ambassador to Ethiopia, Lim Hoon-min. The concessional grant will be allocated to the priority sectors agreed between the two countries within years 2019 to 2020. It will be used for the construction of Adama Center of Excellence and construction of Addis Ababa express bus ways as well as other development projects. April 15, 2019 (Ezega.com) -- The Ethiopian government has weighed in on the recent political developments in the neighboring country Sudan, according to a statement issued today from the prime minister’s office. The Monday, April 15, 2019 statement came a week after long-serving President Omar al- Bashir’s regime was toppled by the military. The now former president is under house arrest in his home located in one of the military barracks. He had been under immense pressure by anti-government protestors who demanded he vacates office. The military said their decision was informed by the people’s woes and what was best for the country moving forward. April 13, 2019 (Ezega.com) -- The Ethiopian government intends to privatize 13 sugar projects, according to FBC new report. The government is in initial stages of consultantions with the private sector to assess the market for the projects. The Ministry of Finance (MoF) and the Ethiopian Sugar Corporation have invited responses to request for information (RFI) to finalize preparation for the privatization of sugar projects. In a joint press conference, the MoF and the Sugar Corporation said, "this is to complete the necessary pre-privatization activities to fully or partially privatize the 13 sugar projects that are either fully completed and in production or greenfield projects." April 12, 2019 (Ezega.com) -- Suspected terror group Al-Shaabab abducted two Cuban doctors in a road ambush at Banisa stage, in Mandera, Kenya. Dr. Assel Herera Correa, a general physician and Dr. Landy Rodriguez, a surgeon, were on the road heading to work when the incident happened. In the 9 am incident, members of the outlawed terror group killed one of the security officers escorting the two medics before escaping into Somalia in a Toyota Probox and a saloon car. April 10, 2019 (Ezega.com) -- Three years after winning a silver medal for his country at the Rio 2016 Olympics, 29-year-old Feyisa Lilesa has been feted by Abiy’s government. Feyisa caught the world’s attention after winning silver medal and then crossing his wrists in protest of Ethiopian government’s crackdown on Oromos. The Oromo, which is the largest ethnic group in the country, were demanding for equal opportunities, an end to police brutality and political reforms. Amhara, the second ethnic group was also in support of the same. April 8, 2019 (Ezega.com) -- The Ethiopian government will be taking steps to restore order in the latest areas of conflict in Amhara and Oromia regions, according to reports from ENA and FBC. The National Security Council of Ethiopia issued a statement yesterday saying federal and regional security institutions will take all necessary measures, legal and proportionate, to restore order. Ethiopia has experienced a breakdown of law and order in some parts of the country in the last few years. This has accelerated since Dr. Abiy Ahmed became Prime Minister. Hardest hit areas are some parts of Oromia, Amhara and Souther Ethiopia regions, areas that saw several ethnic clashes and the displacement of hundreds of thousands. April 4, 2019 (Ezega.com) -- A preliminary report on the Ethiopian Airline crash has established the flight crew followed all the correct safety procedures provided by the manufacturer and approved by the Federal Aviation Administration, but they couldn’t control the ill-fated plane. This has cast further doubt on the system controlling the Boeing 737 MAX 8 model. A preliminary report has been released today by Ethiopia’s Transport Minister Dagmawitt Moges. The pilots of the jet that crashed last month killing 157 on board were unable to recover from a persistent nosedive. The report recommended a review the flight control system. 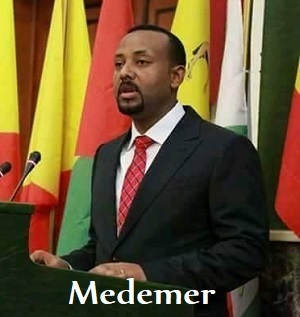 April 18, 2019 (Ezega.com) -- Ethiopian Prime Minister Abiy Ahmed reshuffled his cabinet today, appointing Gedu Andargachew as Foreign Affairs Minister and Lemma Megersa as Defense Minister, perhaps signaling the tough road ahead. Ethiopia is currently experiencing grave security situation, including a breakdown of law and order in many parts of the country, which the Prime Minister has so far failed to bring under control. On the political front, according to some, cracks have appeared in the alliance that propelled Abiy Ahmed to power, the Oromo-Amhara alliance. The current appointments are probably meant to address both. April 16, 2019 (Ezega.com) -- The African Union Peace and Security Council (AUPSC) has called on the Sudanese military to hand over power to a transitional civilian authority within fifteen days, according to FBC report. The African Union's Peace and Security Council (AUPSC) made the call yesterday following a meeting in Addis Ababa to discuss the ongoing situation in Sudan. If this is not met, Sudan will be suspended in all AU’s activities until the restoration of constitutional order, the statement added. April 15, 2019 (Ezega.com) -- Ivanka Trump, duaghter and advisor of US President Donald Trump met Prime Minister Abiy Ahmed at his office in Addis Ababa yesterday. Ivanka Trump along with Mark Green, Administrator of Agency for International Development (USAID), visited Ethiopia and Côte d'Ivoire April 14-17. They are on a tour to promote the Women's Global Development and Prosperity (W-GDP) Initiative, a White House-led, whole-of-Government approach to advance global women's economic empowerment with a goal of reaching 50 million women in developing countries by 2025. The initiative is aimed at advancing global women’s economic empowerment, it was learned. Prime Minister Abiy Ahmed and Ivanka Trump discussed issues of mutual interests, according to Office of the Prime Minister. April 12, 2019 -- U.S. Agency for International Development (USAID) Administrator Mark Green will travel to Ethiopia and Côte d'Ivoire April 14-17. Administrator Green will accompany Advisor to the President Ivanka Trump to promote the Women's Global Development and Prosperity (W-GDP) Initiative, a White House-led, whole-of-Government approach to advance global women's economic empowerment with a goal of reaching 50 million women in developing countries by 2025. The White House said Wednesday that Ivanka Trump schedule includes a women's economic empowerment summit in Ivory Coast as well as site visits and meetings with political leaders, executives and female entrepreneurs in both countries. April 12, 2019 -- The World Bank unveiled a new plan today to help African countries strengthen their human capital. The objective of the plan is to enable Africa's young people to grow up with optimal health and equipped with the right skills to compete in the digitizing global economy. Sub-Saharan Africa scores the lowest of all the world's regions on the World Bank's Human Capital Index, a measurement of how well countries invest in the next generation of workers. The score is explained by high mortality and stunting rates in the region, as well as inadequate student learning outcomes - all of which have a direct effect on economic productivity. April 11, 2019 (Ezega.com) -- President Omer al-Bashir of Sudan is out of power, removed by the Sudanese Military from his post, according to the Sudan Tribune. He is in detention in undisclosed place, according to reports. Omer al-Bashir ruled Sudan with iron fist for 30 years. He took power in a coup in 1989, and has been in power since then. He is wanted by international bodies over Sudan’s alleged support of terrorism and perpetration of genocide in the Darfur region. He is wanted by the International Criminal Court (ICC) on charges of war crimes and other atrocities. Over his watch, Sudan saw the seccession of what is now called South Sudan in 2011. April 10, 2019 -- The US government is funding a project named "Feteh" to strengthen the rule of law in Ethiopia, according to a press release sent by the US Embassy in Addis Ababa. "Feteh" mean justice in Amharic. The project is meant to strengthen the Attorney General Office and also support the Federal Supreme Court of Ethiopia to strengthen commercial benches, revise various framework laws. It is a two-year project funded with $4 million by the US government. Below is the full text of the press release received by Ezega.com. April 9, 2019 -- More than half of children remain excluded from pre-primary education in Ethiopia, despite impressive gains made in increasing enrollment, according to United Nations Children's Fund (UNICEF). The first-ever global report dedicated to early childhood education highlights a lack of investment in pre-primary education by the majority of governments worldwide, says UNICEF. In Ethiopia, although major advances have been made by increasing gross enrollment from less than two per cent in 2000 to more than 45 per cent in 2017, more than half of children of pre-primary age across the country remain excluded. This has contributed to the 175 million children missing out on pre-primary education globally, UNICEF says. Below is the full statement released by UNICEF. April 6, 2019 (Ezega.com) -- The military wing of the Oromo Liberation Front (OLF) has officially separated from the OLF leadership, according to statement from the group and as reported by the Ethiopian Reporter. The OLF military wing, aslo known as Waraana Bilisummaa Oromoo (WBO), said it will no longer follow the the OLF leadership in Addis Ababa. April 3, 2019 -- The United Nations (UN) agency Food and Agriculture Organization (FAO) warns that as many as 113 million people are going hungry, which the agency termed "acute food insecurity, which is far too high.’ FAO further said climate and natural disasters pushed another 29 million people into acute food insecurity in 2018. According to the report, nearly two-thirds of those facing acute hunger come from just eight countries: Afghanistan, the Democratic Republic of the Congo, Ethiopia, Nigeria, South Sudan, Sudan, Syria and Yemen. Below is the full statement sent by FAO of the UN. March 25,2019 (Ezega.com) - Ethiopian Airlines released a statement today saying that the tragic crash that happened more than two weeks ago won't define us. "This tragedy won’t define us," the statement says. "We pledge to work with Boeing and our colleagues in all the airlines to make air travel even safer." The airline disclosed that the investigation into what exactly happened is still in progress. "The investigation of the accident is well underway, and we will learn the truth. At this time, I do not want to speculate as to the cause. Many questions on the B-737 MAX airplane remain without answers, and I pledge full and transparent cooperation to discover what went wrong," said Ethiopian CEO Tewolde GebreMariam. March 23, 2019 (Ezega.com) -- The Commercial Bank of Ethiopia (CBE) donated 100 million birr to Ethiopians displaced by communal violence in various parts of the country, according to Fana news report. Ethiopia saw unpreceneted number of displacement of people from various regions due to ethnic conflicts in various parts of the country. In 2018 Ethiopia became home to one of the highest number of internally displaced people in the world. The situation did not improve in 2019 as hundreds of thousands were forced to leave their natural habitat to places of safety. The displacement of the Gedeos in the southern Ethiopia is a recent example. 1. Who is Behind the Violence and Attacks in Ethiopia? April 9, 2019 -- The world's largest social media network, Facebook, is working with key non-profit and local partners in Africa to create detailed and accurate population density maps for Africa. According to press statement released by the company, Facebook is using advanced computer vision of satellite images and Artificial Intelligence (AI) to create population density maps for Africa. This data can be used to help with large-scale social, health and infrastructure challenges in sub Saharan Africa, the company says. Below is the full statement released by the company. April 3, 2019 -- The US Embassy in Addis Ababa disclosed that nearly 50,000 Ethiopian Health Workers were trained by its project called Strengthening Human Resources for Health. According to the press release, the project also supported the Ministry of Health in developing a 10-year human resources strategic plan to help Ethiopia meet the growing demand for quality healthcare services. Below is the full statement released by the US embassy in Addis Ababa, Ethiopia. April 3, 2019 (Ezega.com) -- Irregular migration from the East and Horn of Africa to southern Africa, presents countries along this route with a new challenge: how to manage these flows while ensuring that the human rights of migrants are respected and protected. March 27, 2019 (Ezega.com) -- Ethiopia has launched an ambitious program of universal access to electricity by 2025, according to ENA report. Dubed National Electrification Program (NEP), the project aims to provide electricity to all across the country. The current launch is a follow up to the National Electrification Program (NEP) that was first launched 2017. The National Electrification Program 2.0 (NEP 2.0) aims to realize universal access to electricity by 2025. The program aims to reach 65 percent of the total population through on-grid electrification, while the remaining 35 percent through off-grid service provision. The NEP 2.0 is expected to cost six million US dollars in direct investment and technical assistance, according to the report. March 2, 2019 (Ezega.com - Ethiopia and Kenya have vowed to see that the Lamu Port, South Sudan – Ethiopia Transport Corridor (LAPSSET) project is fully completed as it’s a key enabler of the economic transformation of the two neighbors. Ethiopia’s Prime Minister Abiy Ahmed and President Uhuru Kenyatta said that completing the LAPSSET project is crucial to unlocking the economic potential of the Sub-Saharan region, let alone that of Ethiopia, South Sudan, and Kenya. This was disclosed during the opening of a two-day trade and investment forum that’s gathered more than 500 investors, business leaders, and government officials from both countries. The two leaders further vowed to strengthen economic ties between their countries. February 20, 2019 (Ezega.com) - To many Ethiopians, life revolves around the ‘leaf.’ Chewing khat - commonly known as ‘Miraa’ in east and central Africa- is the norm. You’ll observe groups of men and in some cases women, laying papyrus grass on the floor of their homes, they burn frankincense and brew coffee, which they drink while chewing khat. They say frankincense sets the mood necessary for chewing khat. But do you know that chewing khat causes liver disease? February 18, 2019 (Ezega.com) - A Niger national, who was expelled from Israel has been stranded at Bole International Airport since November as his home country is unwilling to accept him back. 24-year-old Eissa Muhammad has been staying at the airport under inhumane conditions, as reported by the BBC. His predicaments began last April after he was apprehended for being in Israel illegally. He had been residing in the Middle East since 2011, having fled his home country at the age of sixteen in search for better fortunes. He informed the press that he’d paid traffickers to take him across Egypt and Libya before entering Israel on foot. In Tel Aviv, he survived by doing odd jobs in a sweet factory and hostels until his arrest in April last year for lack of the necessary documentation. February 10, 2019 (Ezega.com) - The statue of Emperor Haile Selassie was unveiled in the premises of the African Union headquarters in Addis Ababa. The unveiling ceremony of the statute was attended by Heads of State and Government attending the 32nd Ordinary Session of the Assembly of the African Union. The statue is in recognition of Emperor Hale Silassie's contribution to Africa’s liberation and unity, leading up to the founding of the Organization of African Unity OUA) in 1963. Emperor Haile Silassie of Ethiopia was one of African leaders who, in the early 1960s, when independence was sweeping throughout the continent, spoke about a united Africa that will end colonization in the whole continent.